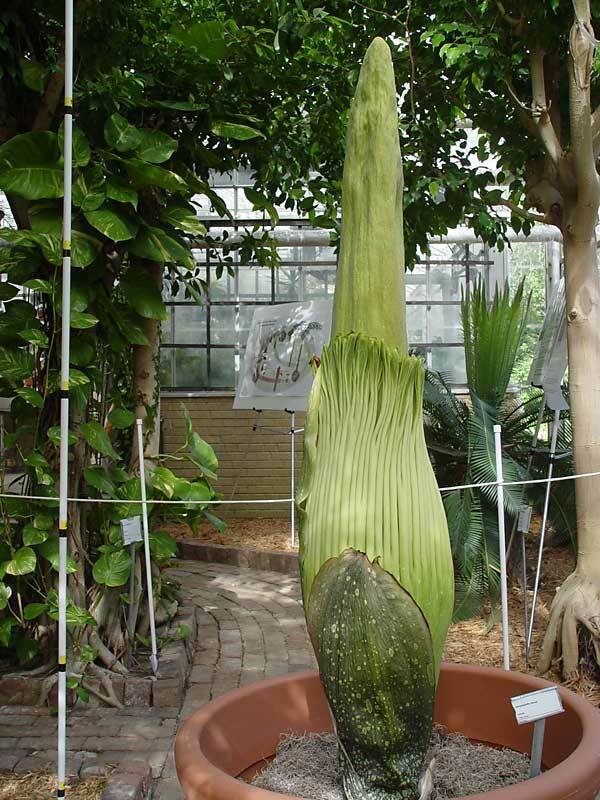 Eastern Illinois University :: H.F. Thut Greenhouse - The Titan Arum Blooms! 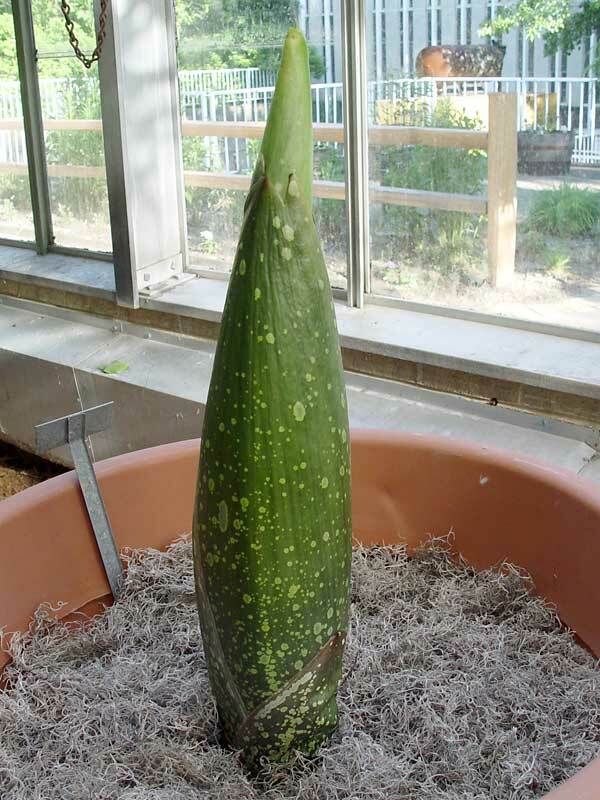 Following six and a half years of vegetative growth, the Titan Arum in the H.F. Thut Greenhouse at Eastern Illinois University produced its first inflorescence in June, 2008. And what an inflorescence it was! Its huge flower and powerful roadkill aroma attracted several hundred flies and three thousand visitors. OMG! I think it's going to flower! The Titan Arum is 11 inches tall. Yep, confirmation. Its producing an inflorescence! 21 inches tall today. It measured 22.5 inches tall and the very top is beginning to open up a bit. As I was about to take pictures of the Titan Arum, the skies darkened significantly as a squall line of severe thunderstorms approached. Moments after snapping two pictures of the Titan Arum, the tornado warning siren on the library roof sounded. Since the greenhouse is not a good place to be in a tornado, I ran for safety into the Life Science Building. Just as I entered the building, the rain started to swirl outside and there was the unmistakable sound of trees being torn apart. I scurried into the men's room for safety as the wind blew the building's doors open and drove rain horizontally down the hallway. Two trees next to the library were broken in half and a large tree next to the greenhouse was topped by the storm. Fortunately, neither the greenhouse nor the Titan Arum were damaged. A quick tour of campus revealed a significant number of trees down or damaged by the storm as well as several semi-trailers tipped over and some telephone poles were broken on Fourth Street. Tree limbs were scattered all over the place. The Titan Arum was 25 inches tall with a 16 inch circumference. The best educated guess as to when the inflorescence will open and "do it's thing" is about two weeks. Stay tuned! The severe thunderstorms continued throughout the night causing considerable additional storm damage and significant local flooding. Eastern's Grounds Crew showed up bright and early on Saturday morning to clear the downed tree away from the greenhouse. They're a wonderful, friendly and helpful group and I sincerely thank them for stopping by the greenhouse to clean up the mess. Other than mashed shrubs and a lot of mud in front of the greenhouse, you wouldn't know that a possible tornado had passed over campus yesterday afternoon. It measured 28 inches tall and 18 inches in circumference. Hmmm. *measures left thigh* 18 inches in circumference. *Measures left leg inseam* 28 inches. So the inflorescence is literally as big as my left leg today. The camera angle foreshortens it a bit... the arum that is... not my leg... :-) The tip of the arum has the cutest little cowlick like Alfalfa had in Little Rascals. 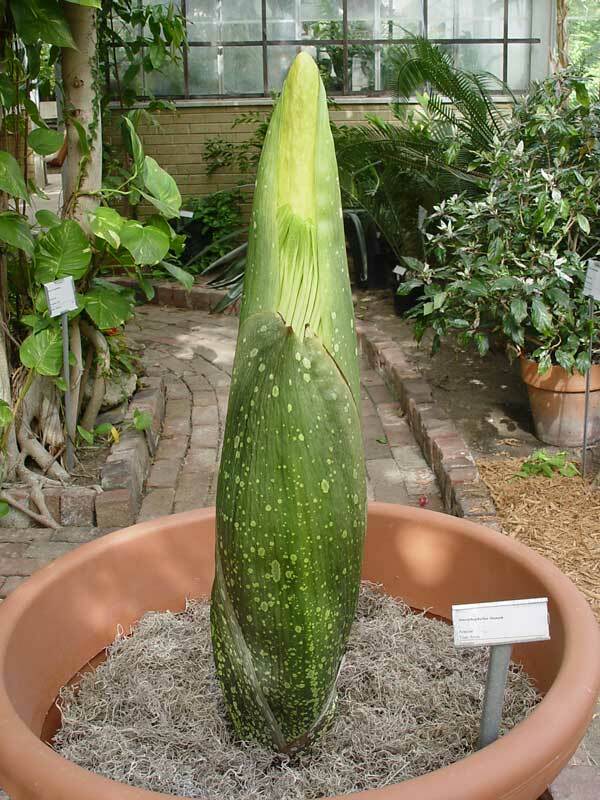 The Titan Arum was 30.5 inches tall and 20 inches in circumference. Its really hot and humid in the Tropical Room. Perfect conditions for the Titan Arum and I'm sure it feels right at home. Although I'm also accustomed to the heat and humidity in the greenhouse through acclimation, some visitors have been bothered by it. So, if/when you do come to see the plant bloom, be aware that we have a "greenhouse effect" in full force, even with the vents and doors wide open and exhaust fans blowing the hot air out. And think about what it will be like in the Tropical Room when the flower blooms. HOT, humid and smelling like rotten eggs. So, I recommend coming to visit in the mornings or late afternoon or evening because it does get HOT in the greenhouse in the mid afternoon in the summer. The inflorescence can also be viewed from outside for those who are uncomfortable in a hot greenhouse or want to see the flower, but not smell it when it blooms. 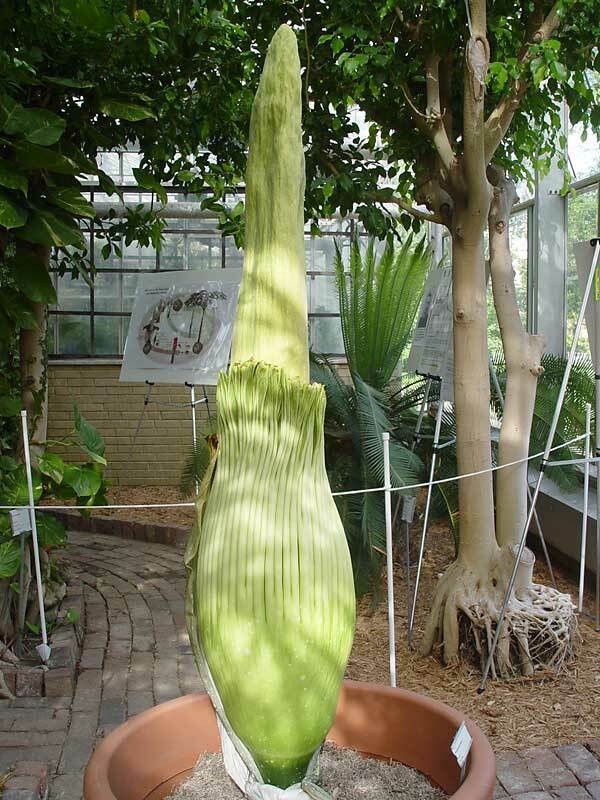 The Titan Arum was 32.75 inches tall and 21.5 inches in circumference. The number of visitors is beginning to pick up. A group of young children (fourth-graders, I think) came to look at the flower this morning with their teacher. I gave a little presentation for the group, describing how big it gets and where it grows and how it smells like rotting meat. Some of the kids went "eeeewww" and wrinkled their noses while a couple of the boys remarked "cool!" The teacher suggested they write down the plant's name. I told them its name is Amorphophallus titanum. One student looked up from her note pad and asked me to spell it. I thought about it for a moment, and said, "It's a Titan Arum. T-i-t-a-n A-r-u-m."
The Titan Arum was 37.5 inches tall and 23 inches in circumference. The inflorescence is beginning to look much more interesting. This morning when I arrived at the greenhouse the spadix and spathe were just beginning to emerge from the bracts that have protected them until now. Soon the bracts will begin to fall away. When the last of the five bracts falls away, it will be an indication that the bloom is expected within the next four to eight days. It's SO exciting! Oops. Knowledgeable sources tell me that the true measured height of the inflorescence should include the peduncle. I had been measuring height from what I thought was the base of the inflorescence, but the peduncle extends down another 2.5 inches to the tuber. So, in case you're keeping score on daily growth, the plant did not grow almost five inches in the past 24 hours. Today's growth was "peduncled" by 2.5 inches to correct the error. All future measurements will include Mr. Peduncle. It was 41.5 inches tall and 25 inches in circumference. That's four inches of growth in the last twenty four hours. The spadix is starting to shoot up! Booth Library has filled a display case in the south entrance lobby with some historical information about the Titan Arum. I suggest you check it out if you are interested in learning more about Titan Arums. I posted a pamphlet (PDF) that provides background information about Eastern's Titan Arum. I had a phone interview with WILL this morning and it was broadcast over National Public Radio. It was 47.25 inches tall and 27.5 inches in circumference. That's 5.75 inches of vertical growth since yesterday! The first bract has dried up and the second is beginning to fall away. 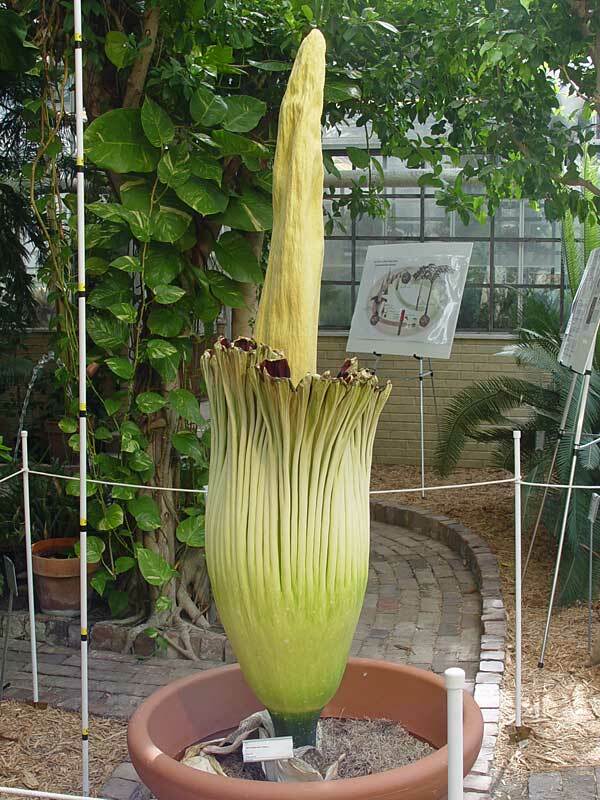 I was told that Good Morning America talked about the Titan Arum this morning (didn't mention us specifically, though). The event shows up on Eastern's home page and has been posted to the June 2008 issue of the Alumni Bulletin. It was reported to me that the bulletin has received more 'hits' due to this story than they have ever had before. Alumni are definitely interested! . Steven Malehorn, EIU Class of '91, '93. The Titan Arum was 51.5 inches tall and 30 inches in circumference. That's 4.25 inches of additional vertical growth. As I carry on casual conversations with the visitors, I sometimes ask where they found out about the blooming plant. The responses include, "I saw it on Eastern's home page." "My son in Colorado read about it on-line in the Times-Courier and called to tell me that I must come down here and have a look." "I was listening to NPR and heard the story, so I thought I would come over to look at it." Many visitors have said they will be coming back every day to monitor the progress. I've had people in the stores recognize me from the newspaper article and ask me when I think it is going to bloom. The news is definitely spreading. The second bract is starting to fall over and the third bract is looking rather ragged. And, yes, the spadix is starting to blush. Events are progressing along quite well and I'm hoping the bloom will open up in a week to ten days with at least a six-foot tall spadix. However, the plant is the only one that really knows for sure when it will bloom. The Titan Arum was 55.75 inches tall and 32 inches in circumference. That's another 4.25 inches of vertical growth in the last twenty-four hours. I spoke with a person who has seen several of these bloom. She said that we should expect to see the bloom fully open for a day or day and a half if we are lucky before it starts to collapse. So it's up to me to stay on the ball and let you know when it will probably open. It's sort of looking like it will happen next weekend-ish, but the date may change based on what it does in the next few days. Stay tuned! The Titan Arum was 59.5 inches tall and 34 inches in circumference. That's 3.75 inches of vertical growth and another two inches in girth. Almost five feet tall and Its girth is as big around as my waist... well, actually a little bit larger than my waist. Technically, it was as big around as my waist yesterday. The Titan Arum was 62 inches tall and 35 inches in circumference. That's only 2.5 inches of vertical growth. It was in the mid 80s in the greenhouse rather than the normal 95-ish in the afternoon. This may account for the slower growth. Otherwise, it may be starting to peak out. I was hoping for at least a six-footer. Grow! Grow! Grow! I noticed a little bit of red beginning to develop along the fringe of the spathe and the spadix is showing a little blush, but the blush has not deepened yet. I still think it will be seven to ten days from now before the bloom opens. The weather is a big factor. The number of daily visitors has increased. Over 200 came by today, 100 yesterday and 50 for each of the days before. So, we have had over 400 visitors since this story "broke." Word has been spreading on the Internet about this event. My brother reports that our Google presence is expanding, though we haven't made it to fark.com yet. Now on to philosophy... 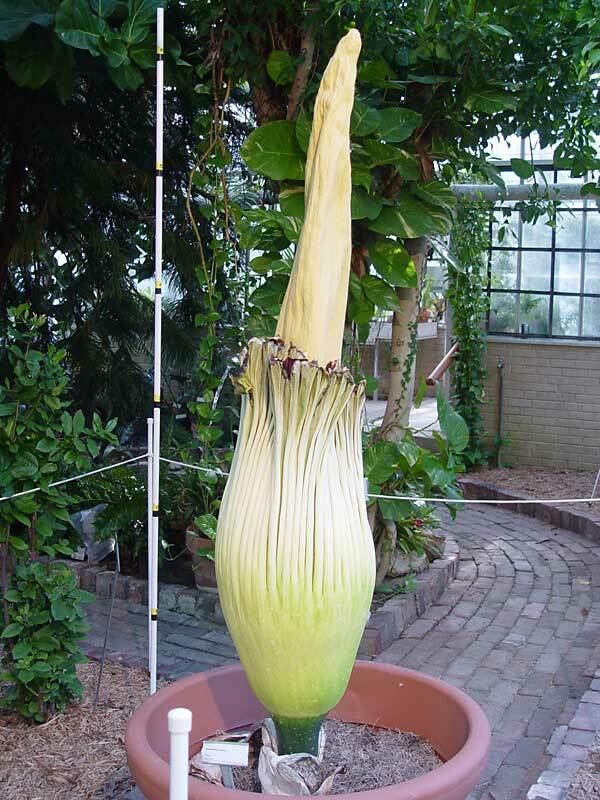 I have been asked a number of times why I haven't named the Titan Arum. Well, it boils down to philosophy. Many people like to give pet names to objects. We like to give names to cars, computers, animals and even plants. I like to name my artwork because I think that every creation deserves a name, even if it is only a simple sketch and lives for but a moment. However, the Spirit of every creation must speak to me. It must tell me what it wants to be. The Titan Arum has not yet spoken to me. Until this past month it has remained a simple seed, a tuber, a single leaf. I could not name a seed that was only as big as the tip of my finger. It was dull and ordinary and remained silent. Every year or so for five years it would send up one leaf at a time. The leaf did not speak to me. It would silently stand there, waiting, watching and listening, but never saying a word. Even the tuber remained silent. Biding its time. Quietly sitting hidden within its womb-like container, never revealing itself to me. It is only now waking from a long vegetative slumber to reveal an inner beauty. Only now is it beginning to speak to me, speak to us all, revealing its message to the world. It's now saying, "I'm HERE! Come look at me!" And we are all listening to what it has to say. We are all paying attention. I have been waiting, waiting, waiting nearly seven years for it to speak to me; waiting for it to speak to me and tell me who it wants to be. I believe It will tell me its name when it is ready to do so. And you can bet your bottom dollar it won't be "Mr. Stinky." The Titan Arum was 64 inches tall and 37 inches in circumference. That's only 2 inches of vertical growth today. The fourth of five bracts fell over at 10AM this morning and the fifth bract looks like it could fall away tomorrow. Now that the peduncle is exposed, I can take more measurements of the inflorescence. 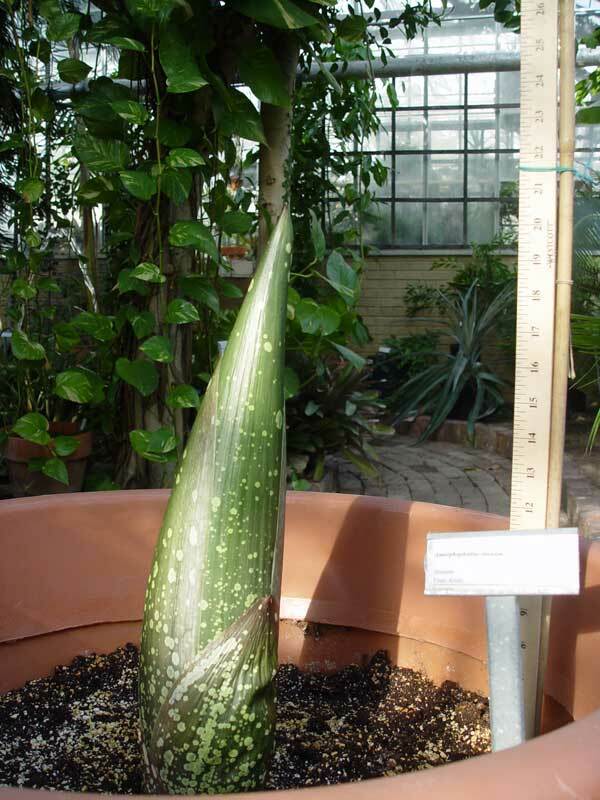 The peduncle is 11.5 inches tall and the spathe is 29 inches from the top of the peduncle to its highest point. The inside of the spathe is definitely turning maroon and the spadix is starting to darken. I am updating my bloom prediction. I think that the bloom will occur within four to eight days. We had more than two hundred visitors today. Visitors are beginning to arrive from out of town, out of state, as part of social groups and as family groups. The live web cam is a big hit with viewers. 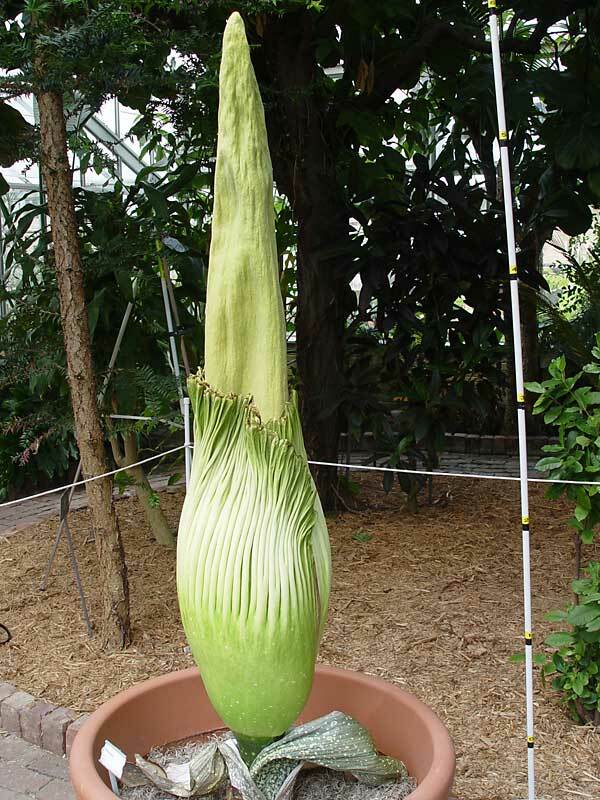 4:36PM Blooming Alert!I just received word from a colleague who has significant experience with Titan Arums and he thinks ours could bloom Friday evening! 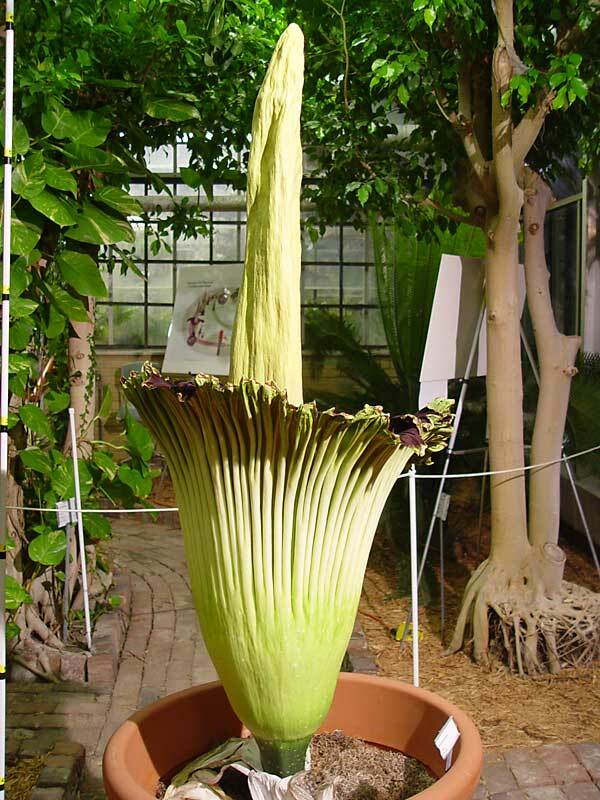 Four noses have detected the slight odor of sulfur starting to come from regions of the spadix if you sniff within an inch of the surface. I just saw a fly sitting on the top of the spathe. The spathe is definitely dark maroon inside. It is possible that the plant may open Friday afternoon or Saturday! Someone suggested that we get a picture of the inflorescence with a person standing next to it to show just how tall it is. The first picture is of yours truly standing next to the Titan Arum. The next person who wandered in to see the plant was President William Perry. His comment upon seeing the inflorescence for the first time was, "It's a lot bigger than I thought it would be." 8:38 PM. The Titan Arum was 65.75 inches tall and 37 inches in circumference. Which means it grew 1.75 inches taller, but not any wider. The peduncle was 12 inches tall and the spathe was 30 inches tall. That means it is still growing. Hopefully, growing means its not quite ready to open and we may have another day or two or three. However, it could come any day now! The spathe is definitely looking like it could open at any time and getting looser at the top. The spadix is still a yellow-green color. I was hoping for a more reddish color to present itself as an indication of readiness to bloom. All five bracts have fallen away. I'm beginning to feel like a pregnant father expecting the birth of his first child. Does it show? 7:15AM It (obviously) didn't open last night. This morning I contacted one of my colleagues about his experiences with his Titan Arums opening. 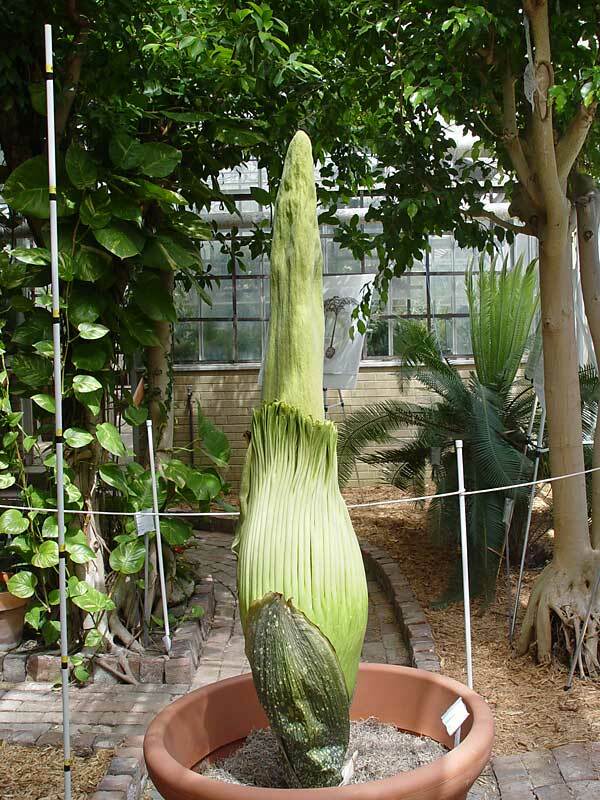 Here's some fresh information he provided about what to expect when the inflorescence opens: Titan Arums generally begin opening in late afternoon and will be almost completely open by early evening. The full stench runs from about 10PM to 2AM. The next morning the spathe pulls in a bit and things gradually diminish over the next 36 hours. There have been some reports of blooms remaining open for 48 hours, but his blooms have been pretty much over with by 30 hours or so. 9:39PM The inflorescence was 66.75 inches tall and the spathe was 38.5 inches in circumference. The peduncle was 12.5 inches tall and the spathe was 30.5 inches tall. What does this mean? It means that its vertical growth has almost stopped and the spathe is plumping out. There was another short burst of odor briefly detectable a short distance away. I have a gut feeling that the flower will bloom within the next two days. It isn't scientific, just a feeling. I turned off the floodlight that had been illuminating the inflorescence from 7PM to 10PM because I was concerned the artificial light would interfere with the plant's photoperiod and cause it to abort the blooming process. I just checked the plant and I don't think it will bloom tonight. Next best guesses are Saturday or Sunday or Monday evening. I had a live on-the-air phone interview with Bub on WMCI this morning. I was kinda nervous, but excited to tell his listeners all about the impending bloom. Thanks, Bub. 4:06AM. I checked on the Titan Arum and it hasn't opened yet. We had over 400 visitors yesterday, bringing the total to just over 1,000 visitors so far. There have been no lines (as yet) to get into the greenhouse and the groups coming in include many families with lots of kids. Parents seem to like snapping pictures of their children standing next to the Titan Arum. The weather looks like it will be quite pleasant this weekend with temperatures in the low to mid 80s and a 40-50% chance of thunderstorms. So bring an umbrella. I don't anticipate lines of people wanting to get into the greenhouse today, but If a severe thunderstorm comes through, the Life Science Building will serve as a shelter until the storm passes. I think it is getting very close to opening. It could be today, tomorrow or Monday. IF it does open today, it will probably start in the afternoon and be fully open by late evening. 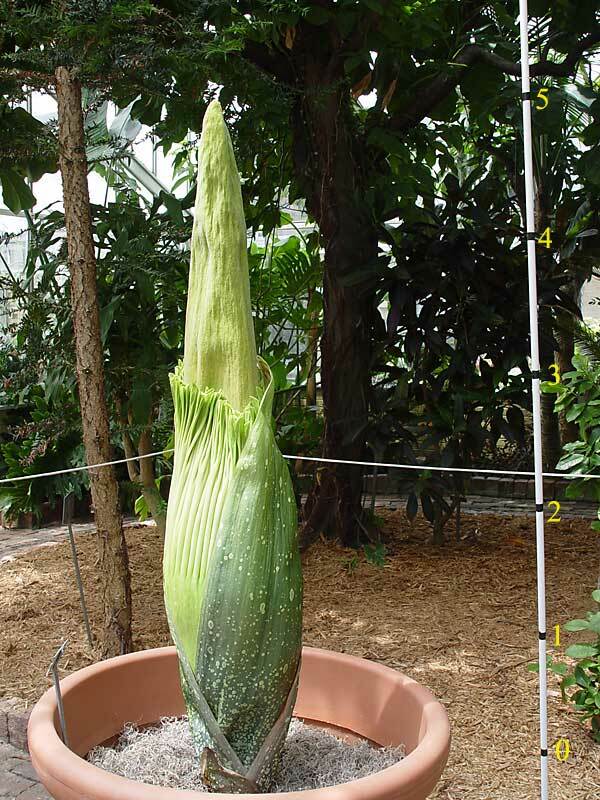 You can check the live web cam at ......... to see the Titan Arum's status in real time. If it does open, I will post a message here ASAP. Normal greenhouse open hours for this event are 9AM to 7PM. If it does open this afternoon, then I will have the greenhouse open until midnight. You can also view the plant through the window when the building is closed. 12:15PM. So far, nothing new to report regarding when it will bloom. The spathe is looking a lot "looser" around the top and the bottom of the spathe is bulging outward more than it was yesterday. The corrugations of the spathe are also spreading out a bit and (I peaked inside) the inside of the spathe is very deep maroon. 1:25PM. NEWS FLASH! This could be it! I noticed that the gap between the spathe and spadix was getting wider and the spathe was "floppy." I'll post more pictures as soon as there is more development and confirmation that it is really opening and not just a figment of my imagination! 1:45 PM Confirmation! It's opening NOW! 5:14 AM WOW! What a ride! Yesterday's opening of the inflorescence was fantastic! Chaotic, but fantastic! The inflorescence started to open at 1:25 PM and it was fully open within about four hours. It is a relatively narrow, tall, dark maroon spathe surrounding a yellow-green spadix almost six feet tall! It looks a whole lot like its "mother." True to the legend of releasing a most malodorous bouquet, it absolutely reeked in the Tropical Room from about 3PM through at least 9PM when the odor began to subside a bit. One visitor reported that she was riding her bicycle a block away, wondering if the inflorescence had opened yet, and the powerful aroma provided her with no doubt that it had, indeed, begun to open. Other visitors said that they could smell it several blocks away and thought there was a dumpster nearby with some seriously rotting garbage in it. It was a truly awe-inspiring experience, not just to have witnessed the opening of this giant tropical marvel, but also to have witnessed the turnout by so many of you last night who were just as thrilled and excited as I was to witness this event. I estimate we received over a thousand visitors yesterday by the time we closed the door at midnight. Fortunately for those who visit today, the odor will have subsided considerably from last night. I hope the inflorescence remains open for most of the day today so as many visitors as possible can gaze upon its enormity. I would like to apologize to those of you who came to visit last night and bore the full brunt of the awful odor as you entered the Tropical Room. I had intended to use fans to blow the odor away from you when you came into the room. However I was "stuck" in the Tropical Room right next to the Titan Arum for ten hours straight and had to position a fan to blow fresh air in through the exit door so I could resist the urge to run screaming from the room. That odor is POTENT in close quarters! It climbs up into the sinuses and will not go away! I would share some of my pictures with you this morning, however, I left all my cables at the greenhouse last night as I stumbled home at 2AM after a very private photo session. Just me and my baby. Together and alone for a brief moment in its all too brief existence. It brings tears to my eyes to witness the birth of my first born and think of how very little time we have together as my baby leaves this world today. Hand me a tissue, I am truly overcome with emotion. 9:38 PM. The spathe began to close up around 5AM this morning. As I was leaving the greenhouse for the night I noticed that the spathe was opening up a little bit again, but raggedly as though restless. I expect the spathe and spadix to begin their decline this evening and slowly collapse. 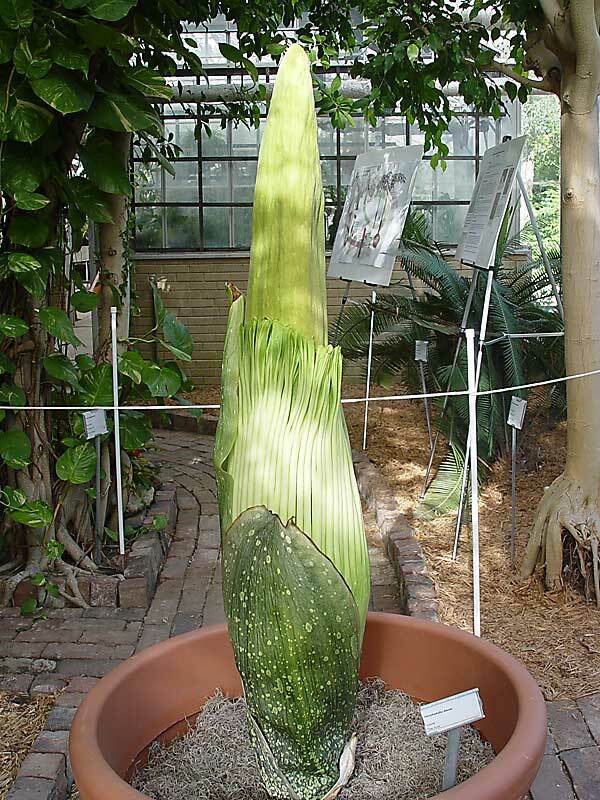 Final measurements are 67.5 inches tall, 39.0 inch circumference, 12.5 inch tall peduncle and 32 inch tall spathe. 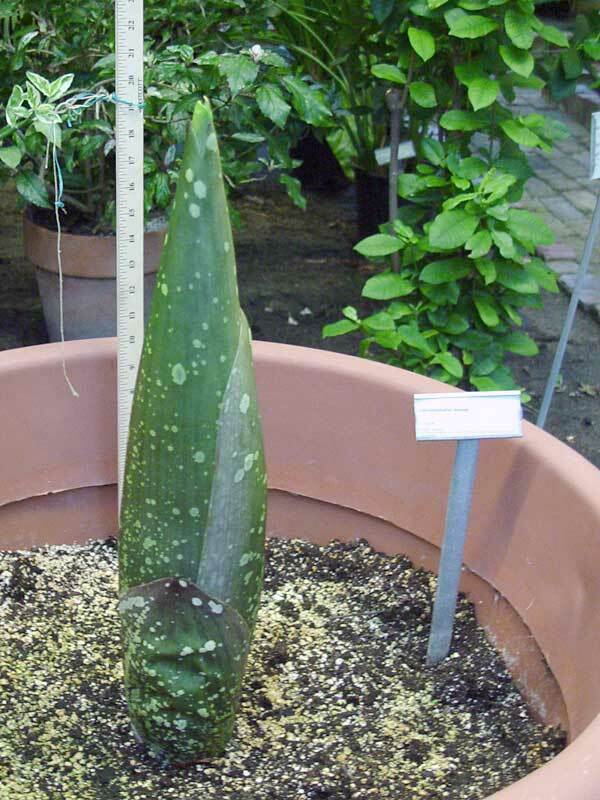 The peduncle is 10.75 inches in circumference just prior to its flaring toward the spathe. We had around 700 visitors today, not as many as I was hoping for, but enough to consider this to be a successful event. That brings the event's total number of visitors to around 3,000. I would like to thank all the faculty, staff and volunteers who helped make this event safe, interesting and educational. Without the help of all of you, this would not have been the wildly popular event that it became. Once again, thanks for all your help. 6:43 AM. I put together sequences of images captured from the live web cam to give you time-lapse accounts of the inflorescence's opening on June 21 (5 minute interval) and closing on June 22 (10 minute interval). Kinda neat! All of those little black specks on the Titan Arum are flies... I'll work on getting the images from my digital camera up on the web site this afternoon. Priority One last night when I got home was sleeeeeeeeeeeeeeeeeeep. It's been a VERY long two weeks. The greenhouse will be open from 9AM until 3PM today for visitors to come inside. 10:00 AM. Here's an update. It's still up and relatively closed and hasn't started to fall over. 10:11 PM Here's a sampling of pictures from Saturday. I knew there were many greenhouse visitors who really, really, really wanted to see the Titan Arum open up and asked me if I could get the plant to wait until Monday to bloom because they expected to be gone over the weekend. Well, I tried my best, but babies are born when they are born and it didn't want to wait. 4:48 AM I just checked the inflorescence and it is still erect and looking respectable, though quite worn and ragged. The spathe's edges are in poor shape and the spadix is quite yellow. The inflorescence is on the decline. In terms of when it will bloom again... I don't know. There are Titan Arums that bloom every two to three years and there are some that require seven to ten years between blooms I certainly hope mine is among the former and not the latter. We will just have to wait and see. 9:50 AM A number of people have asked me if the plant has a name. Yes, the plant revealed its name to me Saturday night. The Titan Arum and I had a long, private conversation Saturday night after all the visitors had left. I will share the experience with all of you shortly, revealing the name at that time because the name requires a story for context. I'm in the process of writing up the story now, which I will post here in a few days. I'm sure you will love it. Note: I'm certain that severe sleep deprivation, lack of food/water and powerful stress hormones surging through my brain had something to do with having a two-sided conversation with a plant at 2AM, but I can assure you that no drugs were involved. 11:47 PM The spathe and spadix continue their decline. Both structures are showing their age. The spathe is quite ragged and decayed around the edges and the spadix is in sad shape. However, the flowers inside are in fine shape. Here are some pictures I took today. And here are some pictures from June 23rd. The spathe was looking tired and the spadix was turning yellow, beginning to dry out and lean over a bit. I cut a window in the side of the spathe so visitors could look inside and I could collect pollen for a colleague. The wall of the spathe was a lot thicker than I thought, requiring most of the width of a razor blade to penetrate. I would like to thank all of you who suggested names for the Titan Arum. Some of the suggestions were "King Thut," "Carni," "Bob," "Baby," and "Audrey." I have selected a name for the plant and will post the story tomorrow. You'll just have to wait. 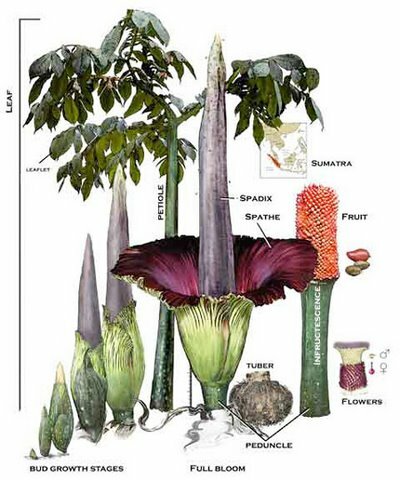 As I looked at the final data, I realized that I'm 66 inches tall (in my stocking feet) and the Titan Arum is 67.5 inches tall. So, if I'm wearing shoes with 1.5 inch heels, we're the same height! Coincidental? I don't think so. 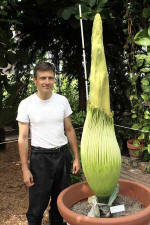 Our Titan Arum showed up in the Times-Courier on Monday and the Daily Eastern News on Tuesday. There were other reports that it appeared on the news on channels 3, 10, 15 and 20. There also were sightings in the Bloomington, Champaign and Chicago newspapers. 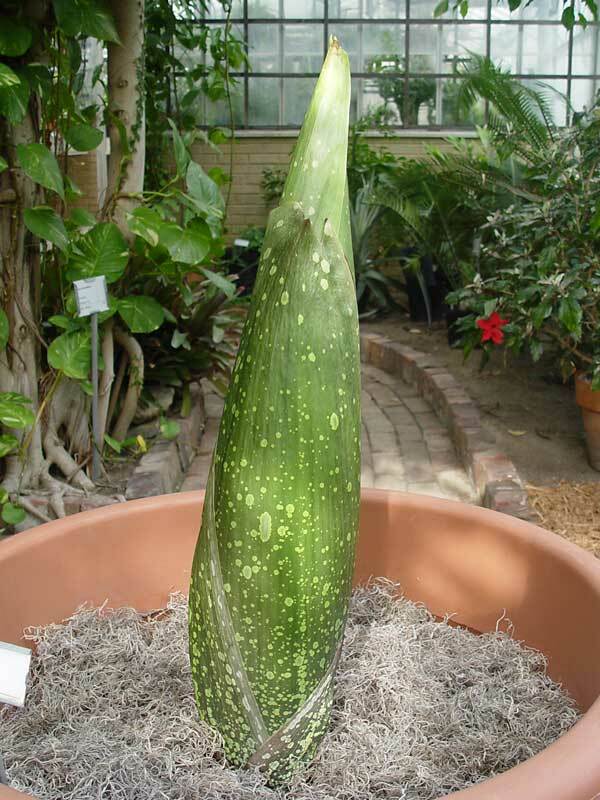 The spadix is v-e-r-y s-l-o-w-l-y yielding to the force of gravity. It is leaning over into the frame (YES!) so I can do a time-lapse of it's demise. Here are a couple of images that show it (yes, Dave, I tilted the camera up so you can see the tippy-top). I'll post captured images daily to help keep those of you who like to watch paint dry informed as to 'Ol Paint's status (no, that's not its name either). I would like to thank Cheryl Birkhead for providing the picture of the Titan Arum through the window from the garden. And... I found yet another use for duct tape! The spathe is becoming more yellowed, flaccid and decayed with every passing day. The spadix is beginning to nod its consent to gravity. I cut a window in the spadix so visitors can see what is (or isn't) inside the structure. Not much there, just a few strands of fluff. Basically, it is a thin, corrugated tube filled with air. I will be sending the excised portions of the spathe and spadix, along with one of the bracts to Logan and his brother because both of them were very helpful volunteers, curious scientists and interested in getting samples to be studied at home. They will use the specimens to accompany their written reports in class of "what I did on my summer vacation." 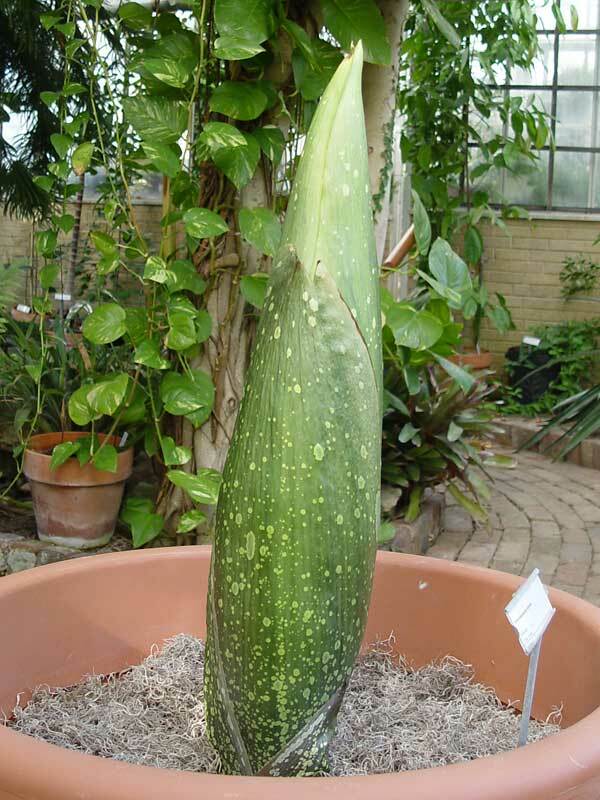 5:10 AM The spadix collapsed early this morning. I was watching as it slowly, slowly bowed its head and slipped away. So very, very sad. I promised you a story about my conversation with the Titan Arum on Saturday night and decided to post the story this morning because the sun is rising and the time is right, I hope you enjoy it. I'd like to thank all 3,000 or so visitors who took the time to wander over to the greenhouse and watch this event unfold. I appreciate every single one of you who came inside to look at this marvel of nature or catch a glimpse of it from outside. I hope you enjoyed your visit to my little greenhouse and gardens, because I enjoyed having you as guests. I even enjoyed explaining everything over and over and over again as new visitors arrived. A big thank-you to the tens of thousands (?) who watched over the Internet as this event took place. If you've ever handled a rubber chicken before, that's what the spadix feels like now. The spathe is starting to feel like an old carved pumpkin. It's no longer rigid, but is starting to feel spongy and brown spots are beginning to appear. The peduncle, however, remains dark green and firm and the female flowers are still healthy. Hopefully, it will produce an infructescence that will rise up and ripen into fruit. Our beautiful lady may have given us her final bow, or she may yet provide an encore. 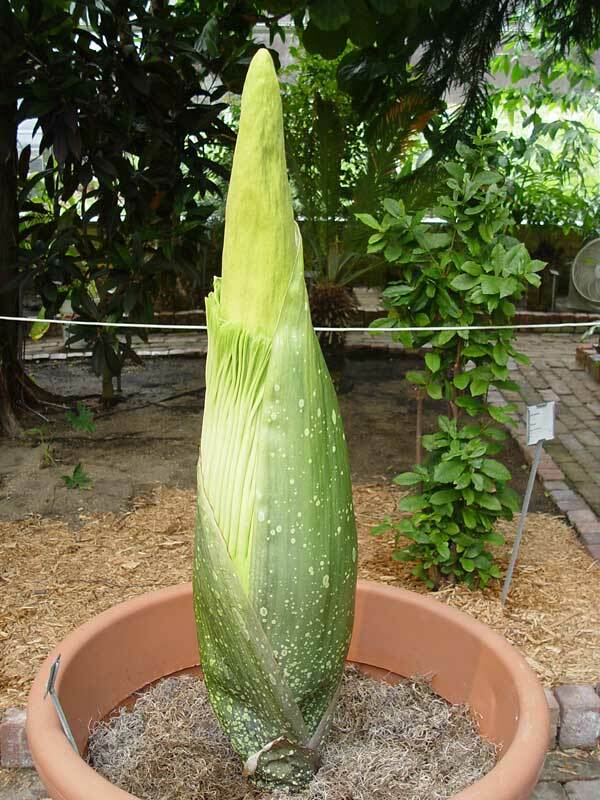 The peduncle is still solid and green and the female flowers do not show any signs of deterioration although the spathe, spadix and male flowers are all wilting away. This may be an indication that it will develop fruit and the infructescence will soon rise into the sky! If that is the case, I will reinstate the webcam so you can watch it grow and develop. If her inflorescence was any indication of her flowering prowess, the fruiting structure should also be, shall I say, titanic! Our Titan Arum is one of very few in the Midwest. 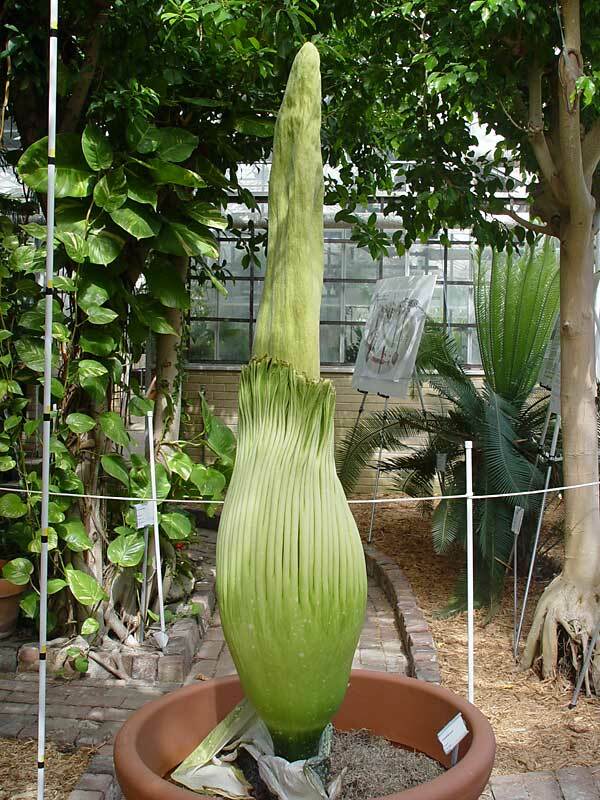 Preliminary word is that this is the first Titan Arum in Illinois to bloom (Woot! Woot!). I feel so very special to have hosted the first. 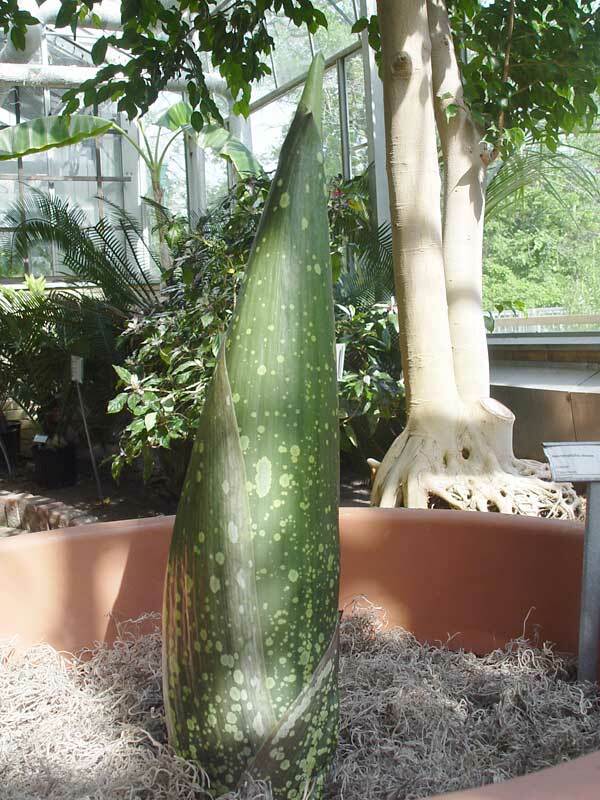 The spadix is now a mummified hollow shell of its former self. Shades of brown and gray and black mottle its surface as it hangs limply and powerless across the quickly dying spathe. The spathe continues its rapid decline and barely holds its own against the tug of gravity, but remains upright, still protecting its precious children as it gradually bows to the sands of time. The mood is somber inside the ragged envelope. The once golden male flowers are withered and now appear as cold and gray as an overcast winter sky. A myriad of microbial attendants from the forest floor are returning the once proud blossoms to the elements from which their lives arose. Browns and grays and fruiting bodies appear across the rapidly changing floral canvas. Yet, the female flowers remain bright and firm and cheery despite their glum surroundings. Small bits of gray fluff at the tips of their now sleeping styles are the only evidence they present that anything may be amiss in their world. Within the flowers, the ovules, those progenitors of seed, once waited for the signal to create new life. But they will remain forever barren, for the signal never came. There was no companion to share his life with her. But she may still burst forth in fruit and her legacy may rise like a phoenix through the death and debris that surrounds her. The pedestal on which she stands is green and firm and solid and ready for the task at hand, which is to thrust her skyward for all the world to see. Then we may admire the fruits of her seven year labor of love. As the spathe, spadix and male flowers continue to disintegrate, the female flowers and peduncle still appear to be healthy. The peduncle and female flowers show significant signs of decay. It does not look as though we will have an encore performance with the development of an infructescence. :-( Blooming of the inflorescence was a wonderful experience over the past month and I am saddened that we will not be able to watch as an infructescence rises out of the ruin and ripens into a pillar of bright red fruit. The tuber is sitting in the pot, covered by a thin layer of potting medium, resting peacefully and quietly once again. I anticipate it will remain dormant until next spring when fresh roots will sprout forth and a giant, single leaf will will once again rise into the stratosphere! I have been monitoring the status of a couple of potential flowering Titan Arums in the Midwest. One grew to a height of three feet before poking the head of its leaf out of the top on Sunday. We were hoping that it might be an inflorescence because it had been seven years since it flowered for the first time. Nope. The second one hasn't developed enough to determine whether it will be an inflorescence or not. Its a sibling of my Titan Arum. We are hoping that seven is a lucky number and it will bloom this year. We should know for sure within a couple of weeks. I'll let you know one way or the other if it is going to flower as soon as I find out. No joy in Mudville. The second potentially flowering Titan Arum in the Midwest sent up a leaf. So there won't be another one flowering locally this year. The dormant tuber is back to being the best house plant ever and will once again be thriving on benign neglect. I'll water it occasionally to keep the surrounding media a wee bit moist, but will for the most part ignore it, and it will ignore me and we will get along just fine. It may currently look like an ugly lump of "whatisit" at the bottom of a pot, but I prefer to remember it as it was, tall, stately, aromatic and gorgeous. The Titan Arum continues to surprise me. 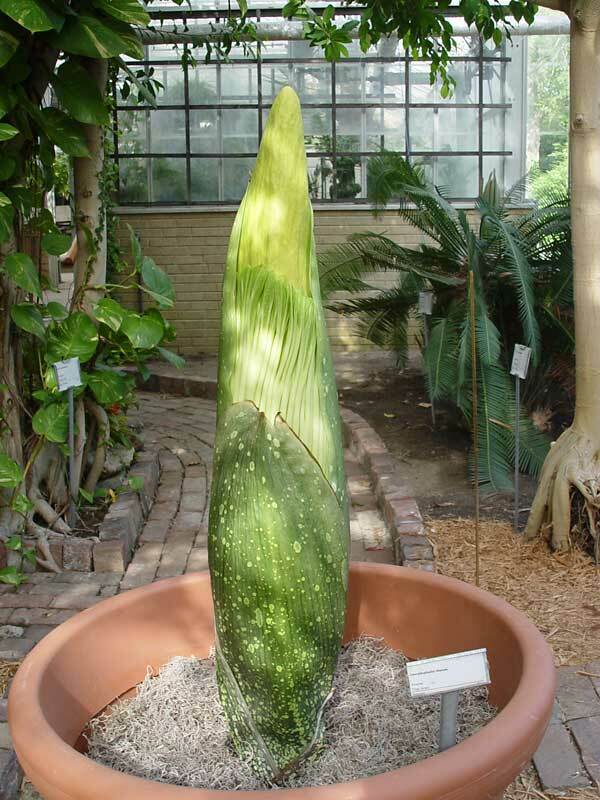 I was showing some visitors the "dormant" Titan Arum tuber this afternoon, telling them how it would sit quietly until next spring before sending up a leaf and I glanced down into the pot to show them that nothing was going on. A bud... two inches tall ...and inch-long roots. Wow. That was a REALLY fast nine months. It was more like nine hamster months. So, it was time to remove the tuber from the pot, clean it off, weigh it and change the media. It was a little like an archeological dig with a whisk broom and a shop vacuum, carefully removing the surrounding matrix to expose the delicate artifact without damaging it. I removed enough media to reach under the tuber's 'belt line' and lift it out of the pot. I pulled it up, held it against my 'belt line,' and noticed a very large ant nest under the tuber. Then I noticed I was covered by ants. Itty bitty ants. Above, below and within MY beltline. As Carl Sagan might say, "There were Billions and Billions of tiny ants, miniscule ambassadors from planet Flowerpot, exploring planet Steven." Well, maybe he wouldn't say that. I inspected the tuber and found a soft spot of rot about the size and depth of my thumb. I cleaned out the rot and evicted two small worms in the process. I gave the tuber a warm shower and put it on the bathroom scale. 30 pounds. It's interesting to note that new roots originate at the TOP of the tuber, not from the bottom. They grow up, reach over and grow downward into the soil to the side of the tuber, then pull in slightly to provide stable support for the giant leaf with the tuber developing below the root system. The leaf is beginning to die back, an indication that the tuber will soon go dormant. The leaf died back completely. I removed the tuber, inspected it, weighed it and replaced the media. There was a small area of rot on the bottom of the tuber. I cleaned the rot off and let the tuber dry overnight before placing it in the new media. The tuber weighed 45 pounds. This morning while watering plants I noticed that the tuber had just started to break dormancy. Woo Hoo! Now we have to wait and see if it's going to be another leaf or another inflorescense.